I hope that it is going well with you! I think the most important thing about today, is that it is Weekly Deals Wednesday! Amazing deals on this week! 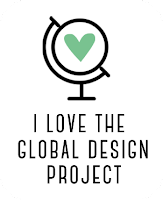 Today is also the day that I share my take on this week's Global Design Project challenge! I really struggled this time! My aim for this week's posts was Christmas and to bring the challenge and Christmas together.... More than a bit of head scratching going on I tell you! I just could not decide which part of this week's CASE the Designer Challenge I wanted to CASE. I decided to CASE the layout with layers of Ink, Vellum and Wood (and a little bit of sewing... AGAIN)! I love how my Snowflake turned out! I spritzed some water onto the You've Got This background stamp (one of my favourite backgrounds ever)! I first coloured my Wooden snowflake with Whisper White Craft Ink, then used Heat & Stick Powder to heat set the Dazzling Diamonds Stampin' Glitter. I tried to use different kinds of layers in place of actual paper layers. Although I agonized over the layout, I'm rather happy with the outcome and with a few tweaks here and there... might just make some more! Labels: Christmas Cuties, Wonderland, You've Got this! That´s so great! Love each tiny detail on your card. Each time I look on it, I found another beautiful thing. Thank´s for playing with us. Die Karte ist SO toll! Ich liebe jedes klitzekleine Detail darauf. Bei jedem Blick darauf, finde ich ein anderes tolles Detail. Vielen Dank, daß Du bei uns mitgemacht hast. Thanks Tanja! As always a lot of fun playing with Global Design Project! I see it, and I love it! Your elements came together perfectly to make this Christmas card work perfectly with Kylie's design. Love it! Your snowflake IS gorgeous. 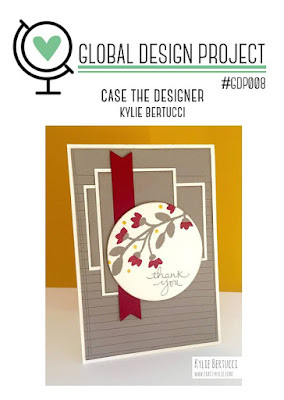 Thank you so much for playing along with this week's Global Design Project CASE the Designer challenge - I'm glad you joined us. Your comments are very much appreciated! Thank you Brian! I can't add anything that hasn't been said. I just LOVE this card! Thanks for playing at Global Design Project this week. Paula Dobson thank you for taking the time to look at my card! I'm very happy that you like it! I love the way the snowflake replaces the circle in the challenge card. You can still see the original layout but with a totally different look. Thanks for playing with us at Global Design Project. Oh my goodness! I LOVE THIS... The sewing through the vellum looks AMAZING. You have me so excited, I have saved it in Pinterest to find it and remake. Thank you for playing at Global Design Project because now I have found your inspiring blog. Teneale you have made my day! Thanks for your kind words! I love all the layers. Beautiful!